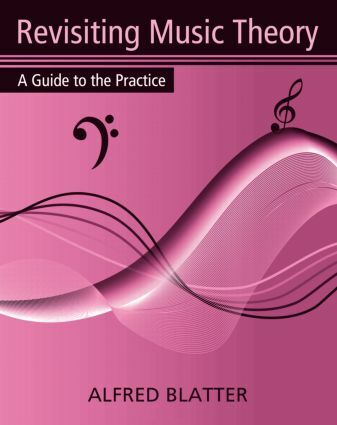 Revisiting Music Theory: A Guide to the Practice contains the basics of music theory with the vocabulary used in harmonic and formal analysis. The book assumes few music reading skills, and progresses to include the basic materials of music from J. S. Bach to the twentieth century. Based on Blatter’s own three decades of teaching music theory, this book is aimed at a one or two year introductory course in music theory, can serve for individual study, or as a review for graduate students returning to school. Drawing examples from well-known classical works, as well as folk and popular music, the book shows how theory is applied to practice. The book is divided into five parts. The first part introduces music notation, reviewing the basics of pitch, time, and dynamics as represented in written music. Part 2 introduces the concept of melody, covering modes, scales, scale degrees, and melodic form. Part 3 introduces harmony, dealing with harmonic progression, rhythm, and chord types. Part 4 addresses part writing and harmonic analysis. Finally, Part 5 addresses musical form, and how form is used to structure a composition. Revisiting Music Theory will be a valuable textbook for students, professors, and professionals.